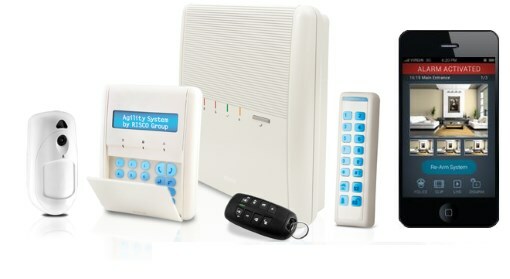 Northern Security brings you the The most Reliable & advanced wireless security system available todate, risco agility 3 wireless intruder alarms system with video verification, fitted in the manchester, tameside area. we offer a free at home or on site working demonstration with no obligation quotation. In the event of an alarm, the PIR camera is automatically activated and captures a sequence of images which it sends to users via RISCO’s Smartphone/ web Application. This capability enables users to view the images and confirm if there is a crime in progress. Monitoring stations can also benefit from the visual verification feature as the capability to ascertain whether there is a false alarm will save them valuable time and resources. Agility™ 3 is easy to install, can be managed remotely and gives peace of mind, and therefore provides benefits for installers, monitoring stations and end users. The 2-Way Remote Control is designed with a status indication LED allowing you to be reminded if you have armed or disarmed the system when leaving or coming to the premises. RISCO Group’s new Flexible Wireless Solution provides security, safety and home automation in a combination of sheer elegance and unrivalled simplicity. Agility incorporates advanced 2-way wireless technology and offers the most flexible solution for the increasing residential and SOHO market, in which conventional intrusion panels are just not enough. Sends SMS when children are safely home from school, Video verification option to monitor children at home. Input/Output & X10 module enables controlling lights, garage doors, garden sprinklers, etc with flexible scheduling. Gas, Carbon Monoxide, Smoke and Flood Detectors. With Agility you choose the relevant communication methods. Simply select any or all of the IP, GSM/GPRS and fast PSTN modules. All modules are located within the main enclosure. Prices starting from as little as £490.00 please call for more information.